Ask fellow campers about "North Phoenix RV Park" and nearby attractions. Great facility for the area, as a younger full timer, my options are limited as to where I can stay in the Phoenix area. Spaces are level, moderately spaced, close to the freeway. We camped at North Phoenix RV Park in a Fifth Wheel. Propane down the street at 27th Ave and Deer Valley, South East corner. Very nice campground. Sites will fit 38' motorhome plus part tow vehicle along side. Good FHU and don't need cable. Local stations are strong. Employees very helpful since we needed to stay a few days longer because of a hospital stay. Had activities going for everyone. Park has many winter people but they were very friendly. I would stay again. We camped at North Phoenix RV Park in a Motorhome. Close to many major stores. This is the worse RV park we have ever stayed in and we have stayed in at least 200 different parks in the past 25 years! The management is rude, unreasonable and unprofessional. The blonde lady everyone talks about is unbelievable and all reviews about her are true. If you complain or even ask about anything, you are asked to leave and there is a no refund policy. There is no customer service. The RV park is run down and dirty. Maybe the management should stop smoking and standing around and actually do some work! They should also take a communication course! There is an adult only section, but really the whole park should be for adults as they do not let children walk around the park or ride their bikes. The only people staying here are one`s forced to due to the low cost. Never stay here! Go park at Walmart if you have to! We camped at North Phoenix RV Park in a Travel Trailer. We stayed here for 2 months ONLY because it was the closest park to where our son lives and the rate was reasonable. BUT, there are some REALLY trashy permanent trailers in the park and a REALLY trashy trailer park behind the RV park. Staff was friendly but when a permanent resident moved a disgusting, piece of garbage, trailer right behind us we complained and they refused to do anything about it. Evidently a permanent resident had moved out of it into another junky trailer and was trying to sell it. It was finally moved after 3 weeks. The RVers were friendly and so were most of the long term residents. Also, when we arrived the owner told us that he was going to be replacing the ratty picnic tables. Saw in a review from 2010 he was saying the same thing. Still has ratty picnic tables. We could not use ours. We would not stay here again. Rate is based on monthly rate + electric. We camped at North Phoenix RV Park in a Fifth Wheel. Good location on north side of town with easy access to malls and restaurants and healthcare. Management was friendly and helpful. We ended up staying here 4 months instead of just 2 weeks that we initially planned. March-June. Pool and hot tub are on opposite sides of the park. Also some unusual campers here that work for the carnival. (Literally 20 people sharing a camper.) Lots of snowbirds, and year round residents, and students from the motorcycle school. Cable TV and internet are good. They also offer RV storage. If you are in search of a campground with the best weekly rates, this is it. Had a hard time finding affordable weekly rates in the area and lots of parks are 55+. They keep good tabs on the property and patrol it. We felt comfortable leaving our rig here for a week while we did a side trip. Sites are basic gravel. Occasional smells of garlic from the restaurant nearby. Also next to the castle adult frills store. We camped at North Phoenix RV Park in a Motorhome. Rate was based on the weekly rate. The office help was very friendly and accommodated our needs in advance of our arrival. I arrived 30 mins after office hours, and they opened up and booked us. Tables are in need of refurbishing, and manager said it was on the schedule for this summer. Showers in the adults section could use some of those narrow flip up seats to make shower use easier by flipping up out of the way when exiting the showers. Whirlpool temp was nice and hot. Park staff was always ready with a smile, nod, or a wave. Will come back again next spring training! We camped at North Phoenix RV Park in a Motorhome. Good parking, good spacing, nice pool. Lots of locals, but clean and friendly. Will go back. We camped at North Phoenix RV Park in a Motorhome. Very rude manager who treated us like we were a bother from the minute we arrived. We were given a key to the laundry room where the internet access was for after 9:00pm use by the office staff. When we tried to use it the manager completely flipped out and screamed at us. We were also treated rudely when after being told to "pick any site" when we arrived. The manager came over to us and asked us why we picked a site with a broken electric meter and told us to move. We camped at North Phoenix RV Park in a Travel Trailer. The managers were very rude and treated most people in the park like they were better than them. While I was here, they went through 3 office helpers and now are on the fourth. I don't know how many outside people they went through. Would never stay at this place again unless I knew they had new people working here and cleaned up the place. We camped at North Phoenix RV Park in a Fifth Wheel. 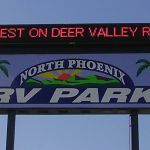 Are you affiliated with North Phoenix RV Park ?